At about 9:30 p.m., on the night of September 21, 1954, a flight of three F94-C Starfire aircraft were returning to Otis AFB during a driving rain storm in what was described as “zero visibility”. The first of the three jets, piloted by 1st Lt. Frederick J. Luddy, 25, was cleared to land, but upon touchdown a landing gear tire blew out bringing the jet to a skidding halt and disabling it in the middle of the runway. Lt. Luddy tried to call the control tower via radio to inform them of the situation, but got no response due to radio communication problems. The men in the tower, unable to see Luddy’s disabled plane, cleared the second of the three F-94s to land. That aircraft, piloted by 2nd Lt. Anthony Cunningham, 26, and his radar observer, 2nd Lt. Joseph Gallagher, 24, fell short of the runway due to poor visibility and crash landed amidst some small trees and brush. Neither man was injured, but the aircraft suffered damage. There was no fire afterward. Those in the tower had failed to see the crash, and were still unaware that Lt. Luddy’s aircraft was still sitting in the middle of the runway. 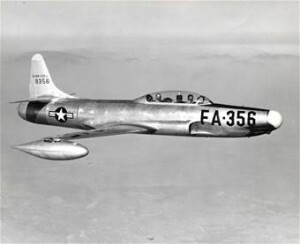 They therefore cleared the third F-94 to land. That aircraft was piloted by 2nd Lt. Russell H. Olson, 24, and radar observer, 1st Lt. John T. Steele, 24. Lt. Olsen made his approach unaware of the situations involving the other two aircraft. Meanwhile, Lt. Luddy, and his radar observer, had climbed out of their aircraft and attempted to signal Olsen with a flashlight, but it was of no use. At the last moment both were forced to dive for cover just as Olsen’s jet crashed into Luddy’s and exploded in flame. Both Olsen and Steele were killed. Lt. Olson is buried in Sunset Memorial Park Cemetery in Minneapolis, MN. Lt. Steele is buried in Machpelah Cemetery in Le Roy, New York.